There’s probably something seriously wrong with us, but some of those toys in Fluffy Favourites slot are really disturbing. It’s like they are suffering deep inside, despite all the colorful looks and fake smiles. Okay, whatever. The slot is cool - there’s bonus round, free spins, and wild symbol with extra benefits. 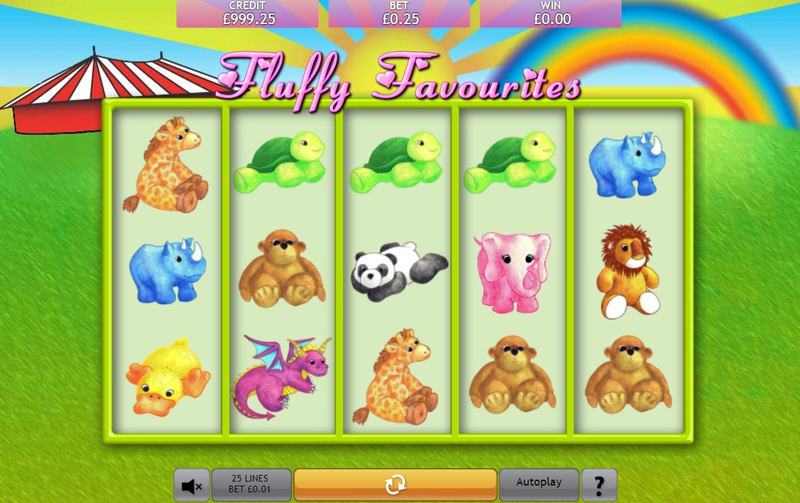 Fluffy Favourites is a video slot that is mostly seen on the bingo websites for some reason. It is developed by Eyecon, and is constantly on the “Featured games” list these days. If you haven’t guessed it yet, it’s all about cute little fluffy toys, who look at you with sad blank beady eyes, trapped behind the reels for eternity. Nah, just kidding, we’re sure they’re having a blast there. Although, look at that baby panda sprawled miserably on the floor. It’s like “OMG, what am I doing with my life”. Alright, we’ll probably stop this. The slot is cute, seriously. Theme aside, it’s a pretty standard 5-reel video slot, with both free spins and bonus round, and wild multiplier to add to the fun. The most important toy-symbol on the playground in a pink elephant-girl. Of course you can’t be 100% sure it’s a girl these days (we know a guy who came back from Thailand and has been telling stories), but that would be our best guess. Anyway, the symbol. It’s both wild multiplier and scatter. Any win from a combination it completes is doubled, and when you get three or more of them scattered around the reels, you get yourself some free spins with all winnings tripled (up to 25, depending on the number of elephants). Then there’s the Claw symbol. Three of those activate the Toybox bonus feature. It’s themed as a claw machine, where you pick a toy and reveal your prize (up to 100 times the line bet). The number of picks is equal to the amount of Claw symbols you got when you activated the round. Fluffy Favourites is a cute slot by Eyecon, that is packed with several features, like free spins, bonus round, and wild multiplier. The bonus round is pretty basic, but can still bring you some nice rewards should you activate it. Click here to play Fluffy Favourites - this may be your only chance to really get something out of a claw machine.